Well this is definitely worth a news post on the front page in my opinion. Aeon Knights won a very hard fought run to conquer the planet of Taris. The worthy opponents were Mostly Harmless (Balkan Force and Guardian of Stars merged NiM Ops guild you may remember from Ahto City). As a guild we almost reached 10 Million points and could well have done so if the opposition hadn't thrown in the towel a good 24 hours before the end. 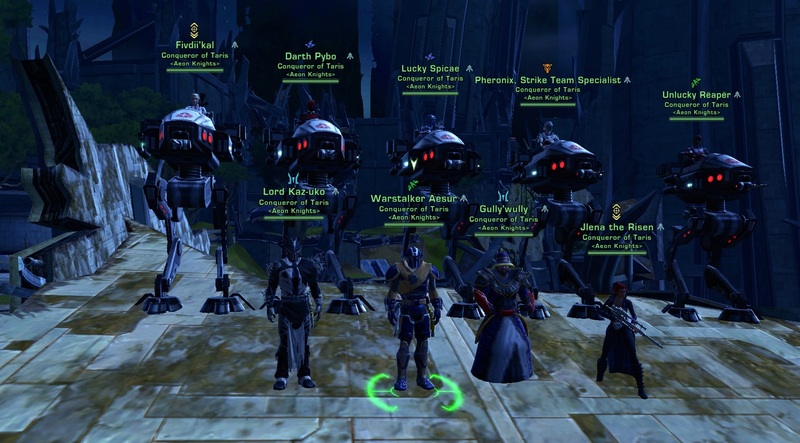 We had people who were new to SWTOR Division and recruits making contributions as well as long term members. Thank you and congratulations to everyone! AK strong! -Highest for any guild on Taris on any server worldwide. -5th highest score of any guild in the World. -5 of our players achieved scores over 1 million each. Egel, Lemmers, Fazor, Zero9 and Mazio. Pybo also came close. -25 members made some contribution. Every point counted even if you couldn't make a huge contribution it helped keep us sane when we would log in having lost a 200k lead overnight. The numbers are fairly accurate but don't berate me if they're not perfect i may have miscalculated some. There is no ranking and some people's contributions in donations to other crafters wont be included in this so don't use it as e-peen. Well done. Seriously though, a big thanks to the guys and gals that helped me out with mats over the weekend as that probably helped me generate a few hundred k in crafting without spending the very last of my money on buying the missing stacks i needed. Congrats to everyone who took part and contributed to last weeks conquest, it was amazing to see what our small guild was capable of!